Our books are available in two separate formats: eBook (read) and auidobook (listen). This makes it so that listening and following along is not possible from just one book. There is a way to listen to a book and follow along at the same time, but it requires that you have both formats available in your Library. Once you make sure that both formats are available in your Library, you can proceed. The first step is to locate and open the eBook format. This will be the one that has the text, and will be the one you will read to follow along. Once you have it open, you will notice that in the top right corner of the screen, there is an icon of two boxes stacked up, with a number in the middle. These are "Tabs". 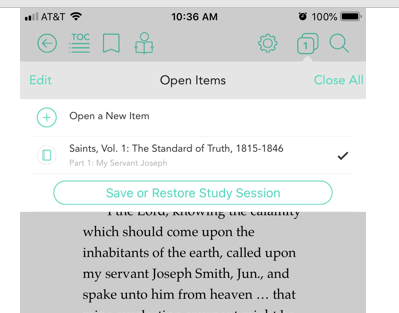 You will be able to have different books open at a time, putting each book on its own tab. The eBook you have open now will be on one tab. Tap on the Tab icon. This will open a new drop-down menu. You will notice that your eBook will be on one of the tabs. To open a new tab, tap on "Open a New Item". This will take you back to your Library. 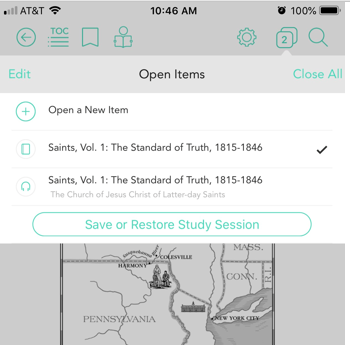 Find the auidobook version of the book you want to listen to, and open it. Download the book, and begin to play the audio. Once the audio begins to play in the auidobook tab, tap on the tab icon again. You will notice both the eBook and auidobook versions will appear as separate tabs. The eBook will be indicated with an icon of a book, where the audiobook will be indicated with the icon of headphones or a play button. Tap on the tab that contains the eBook. The audiobook will continue to play in the background, which will allow you to follow along in the eBook tab. Once you are finished listening, or need to pause the audio for any reason, you will have to navigate back to the audiobook tab and pause it there. To do so, simply tap on the tab icon, tap on the audiobook tab, and pause the audio.